Capsule Summary: Colonel Potter and Hawkeye head to a Korean Army hospital to deliver supplies and lend a hand in surgery. I suppose, given the title of this episode, I can be forgiven for thinking “Hawkeye Get Your Gun” was the episode with Hawkeye’s famous “I will not carry a gun” speech, which was actually delivered during “Officer of the Day” in Season 3. Once Hawkeye and Colonel Potter were in their foxhole, I was certain the speech was right around the corner. I was wrong. Hawkeye not wanting to take his sidearm along on the trip was certainly in character. He didn’t even like touching it. B.J. didn’t have the same reservations, however. Aside from the brief mention in this episode to basic training, I don’t believe we ever really learn anything about what sort of military training the doctors received after being drafted. Presumably they all had at least rudimentary training with firearms, even Hawkeye. He didn’t seem to know how to handle his pistol in the foxhole, although to be fair he was drunk and probably didn’t pay much attention during basic training. The highlight of the episode is without a doubt Colonel Potter and Hawkeye talking after surgery at the Korean Army hospital. Watch Harry Morgan’s facial expressions during reaction shots while Hawkeye is trying to get him to fall asleep by saying the word sleep three times. I can’t be the only one who finds it unrealistic that Potter and Hawkeye would get drunk during the ride back to the 4077th? Ignoring the fact that drinking and driving is dangerous under the best circumstances, they’re driving through unfamiliar and dangerous terrain. They were told by MPs that the area isn’t secured. A man with Colonel Potter’s experience would know definitely better and even Hawkeye would probably think twice before drinking. What’s with Frank’s bizarre preoccupation with Colonel Potter’s age? I think it would have worked a little better during the early part of Season 4 when Potter was first introduced. But in Season 5? Why would Frank suddenly decide to start worrying about Potter’s age after working with him for so long? Nevertheless, it is amusing. Klinger’s king of the gypsies act is a particularly good one and his total commitment to the Zoltan persona was admirable, with the one exception of his total surprise after drawing a straight while reading the future in cards with B.J. 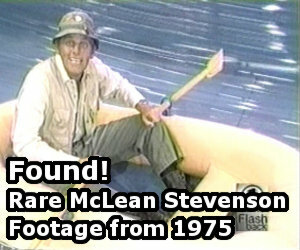 Neither Radar nor Father Mulcahy appear in this episode. Radar’s absence is mentioned in the episode: he has a four-day pass and left an annoyed Klinger as temporary company clerk. Why didn’t Colonel Potter and Hawkeye go with the U.S. Army patrol that came upon their foxhole? Even if it was going in the wrong direction they were safer with the soldiers than stumbling around on their own. Mako made his second of four appearances on M*A*S*H in this episode as Major Choi, who is familiar with the work of old Ferret Face. Fans of Arrested Development may get a chuckle out of Hawkeye and Major Choi saying “annyeong” (the captions have it spelled “anan-nyung”) when Hawkeye and Potter drove away from the Korean hospital. It means both hello and goodbye. I consider this to be a pretty average episode: not one of the best, but definitely not one of the worst – just average. I really can’t even think of much to say about it. I love this episode. It may not be a particular standout, but it’s so representative of where M*A*S*H was by that point and how the show could pull off these ridiculously entertaining “filler” (though I really hate to use that term) episodes with seeming ease. IMO it’s just plain entertaining from start-to-finish. Lots of good one-liners, too. My favorite may be the one at beginning: “Don’t take it personally Colonel, Frank was just trying to insult you.” And the back-and-forth between Hawkeye and Potter while Klinger is pitching his latest scheme at the start is fantastic. I’ll admit the drinking and driving is a little unrealistic all things considered, but the various toasts Hawkeye and Potter make while doing it are a riot. Klinger’s nose? That’s a double! Hawkeye: I’ll treat their wounds, heal their wounds, bind their wounds, but I will not inflict their wounds. Simply put, an enjoyable episode especially Hawkeye & Col. Potter’s drunken ride and subsequent exchange of gunfire. Everyone, whether drafted or enlisted, and regardless of MOS, receives the same basic training – six weeks of military protocol, weapons, hand-to-hand, survival, field maneuvers, etc. After that what happens depends on MOS, doctors are typically sent straight to a duty station. In the episode “They Call the Wind Korea”, Winchester wears his sidearm (apparently the standard issue .45cal automatic) outside his coat; it is clearly visible when he is tending the Greek soldiers. I always thought this odd since he was on his way to R&R in Tokyo. By today’s standards Potter and Hawkeye getting drunk while driving home seems quite ill-considered. But attitudes in the early fifties were quite different, especially for soldiers in a war zone. 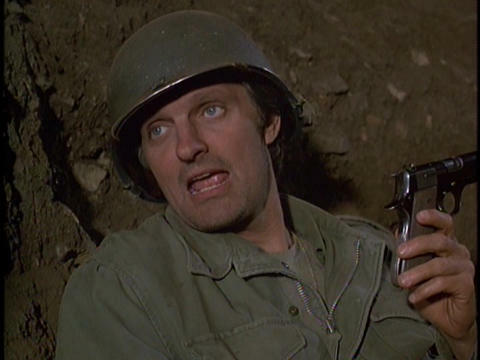 As an aside, another bit of reality missing from MASH (because it wasn’t allowed on TV) is that probably at least half the people in the military back then were serious cigarette smokers. Not to mention language should be rife with profanity. They occasionally had smoking GIs on the show, one of them accidentally set fire to the laundry. the doctors not so much. And Potter liked cigars. The contrast between Potter, an experienced combat veteran, and Hawkeye the pacifist is the most interesting part of this episode-even while intoxicated, Potter seems to be a very good shot. Can you imagine Henry in a similar situation? He’d have been more scared than Hawkeye! Since “The Price of Tomato Juice” has yet to be drafted by RJ’s system I’ll put this here, maybe Frank was on to something regarding Potter’s age. While otherwise an enjoyable deal for a deal episode, it always strikes me as an unbelievable senior moment for Potter to just forget he was so drastically allergic to the title beverage.